Detail from Brucemore’s membership brochure. At last week’s workshop on historic house management in Iowa, I discovered that Brucemore, a historic house museum in Cedar Rapids, is encouraging membership with testimonials from members. Inside a tri-fold brochure (pdf), three members—an artist, volunteer tour guide, and a neighbor—share what they like about Brucemore and how it’s made a difference in their lives and the community. When I was 14 years old, my family took me to the Classics at Brucemore to see Romeo and Juliet. 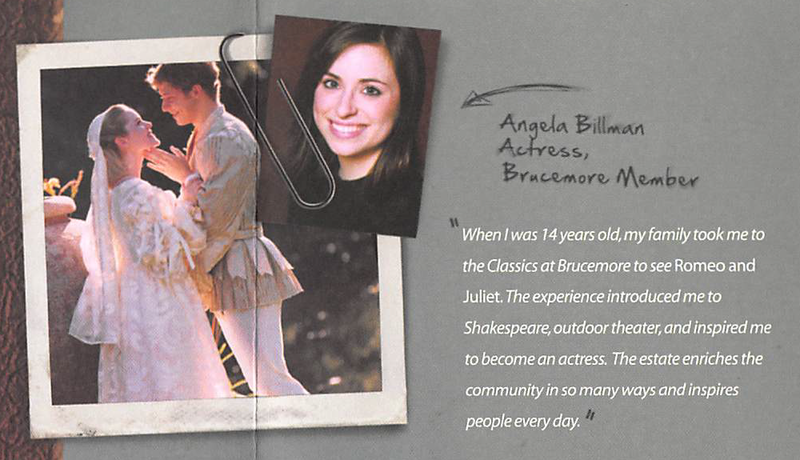 The experience introduced me to Shakespeare, outdoor theater, and inspired me to become an actress. The estate enriches the community in so many ways and inspires people every day. It’s a clever idea because it shifts from the site promoting itself to members promoting the site. It’s people connecting with people, not a faceless organization talking to the general public, which is the most effective way to raise funds and build membership. Notice, too, the contemporary graphic design that uses sans serif typefaces, photos placed at an angle, tint blocks, textures, and three-dimensional elements (such as the paperclips). This moves it away from the Times Roman typeface, fixed grid of photos, and goldenrod paper that’s far too common at house museums. If you’re revising your membership brochure, you might want to consider these techniques to make your content and design more attractive and engaging. This entry was posted in Community engagement, Membership and tagged Brucemore, Iowa, Membership on May 4, 2016 by Max van Balgooy.